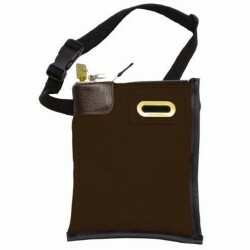 Looking for belt extenders that fit Block & Company tip bags? We can make them. A customer called looking for these. They had tried ordering some elsewhere only to find that the buckles weren’t the same so they wouldn’t work. The buckle on the tip bag was an ACW CSR 1″ which is something we have in stock. For under $3.00 each our customer now has belt extenders. Not having been to more than 2 or 3 casino’s in my life, I don’t have a clue how a tip bag is used but I hope the employees need them because they are getting massive tips and need a secure way to transfer them to their bank accounts. 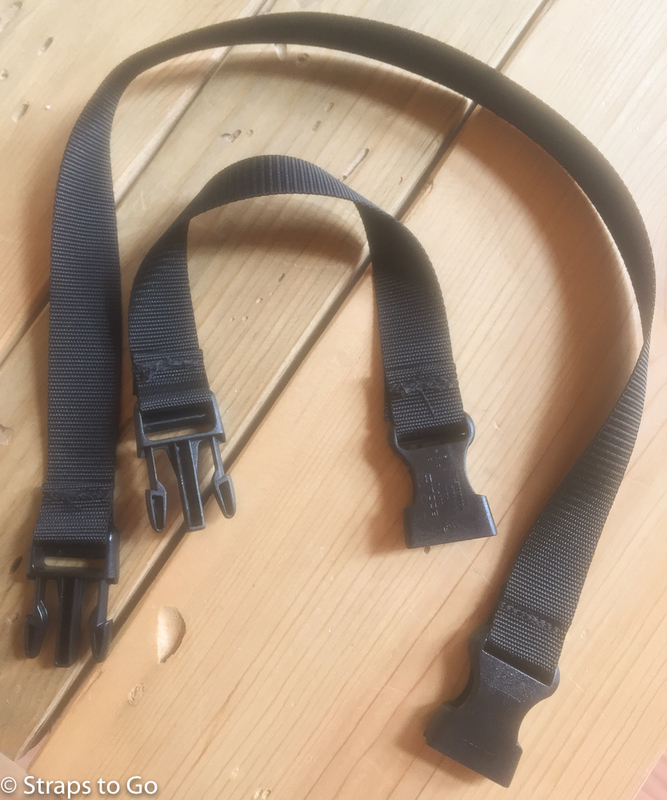 Here are examples of a 12″ and 24″ strap extenders made from #630 black 1″ nylon webbing and ACW’s 1″ CSR buckle. We can make these any length and this webbing comes in many colors. Cam buckle straps with heavyweight nylon webbing are just the ticket for securing luggage on your roof rack. Each summer we take a bicycling trip with a group of friends and usually our luggage carrier is overloaded. We have tried getting the group to pack less but that has had minimal success. 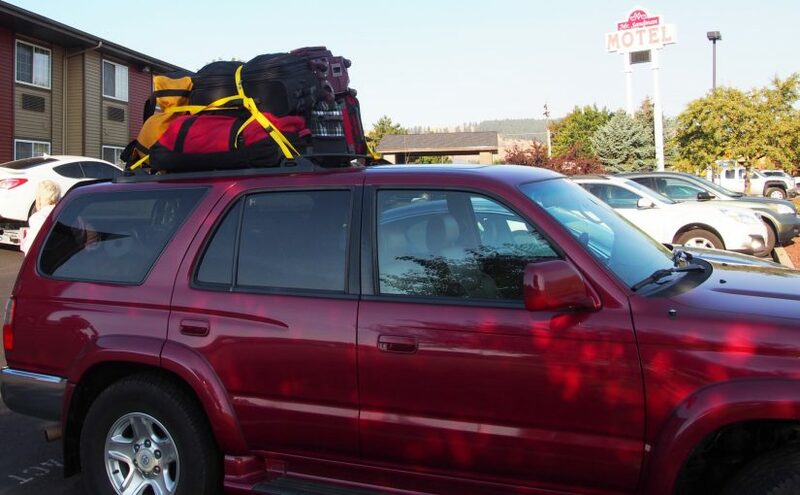 It has been easier to pile the extra luggage on the roof and secure it with cam buckle straps. 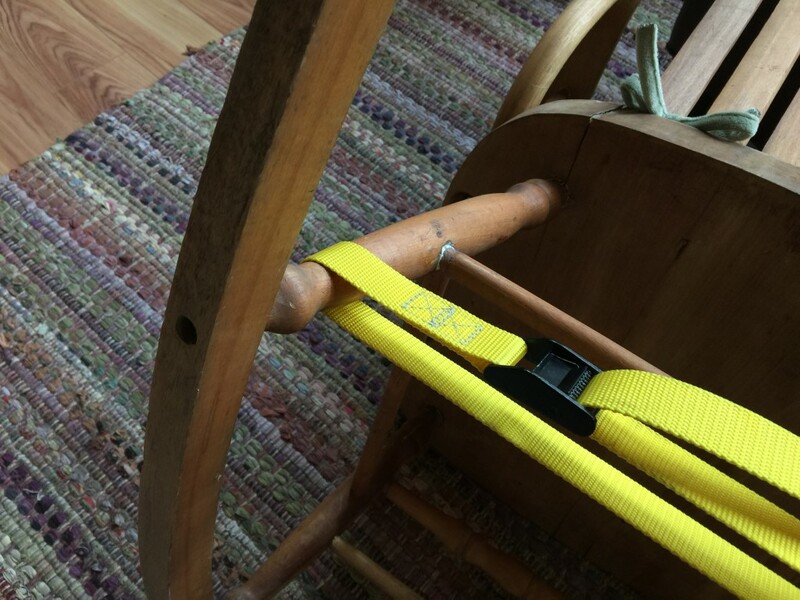 Actually these are the same straps that I use when repairing chairs, heavy weight nylon webbing and metal buckles. 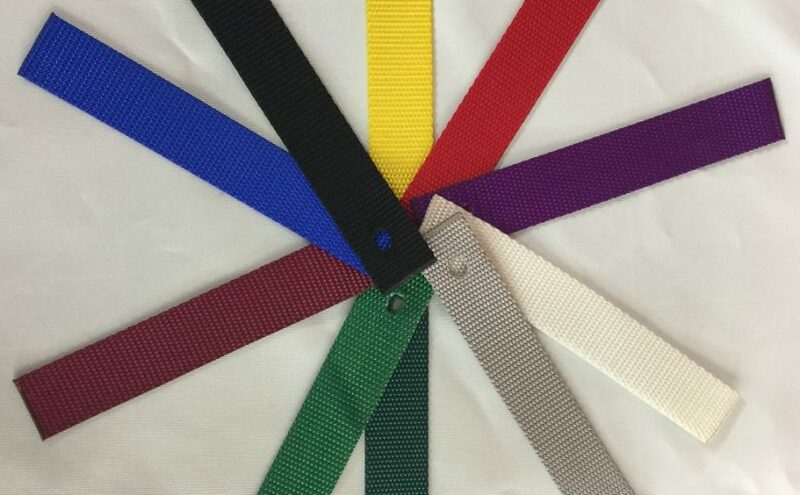 We sell these straps with several choices of webbing colors. They are all made to order so we can set them up to meet your needs. Just give us a call at (253) 883-5800 and we will work with you to get them just right. If you need something stronger we have ratchet buckles although they are not as easy to adjust. I am in favor of using more straps rather than one or two super strong models. The last thing I want to do is damage the roof rack. Standard weight with a breaking strength of around 900 pounds for 1″ width material. Heavy weight with a breaking strength of around 2750 pounds for 1″ width material. Mil-Spec with a breaking strength of 1200 pounds for 1″ material. Tubular with a breaking strength of 4000 pounds for 1″ material. Standard weight on the left, heavy weight on the right. 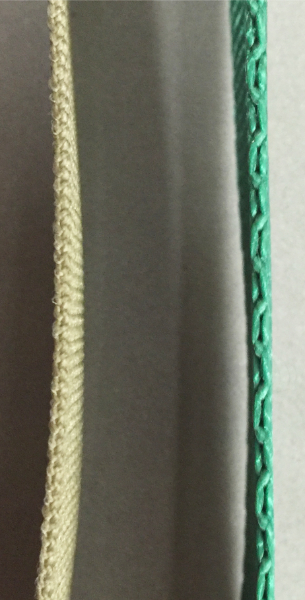 The image above shows commercial grade webbing in both standard weight (on the left in light green) and heavy weight (on the right in dark green). Note that when I listed the breaking strengths above, I said “about” since these are not load rated goods. 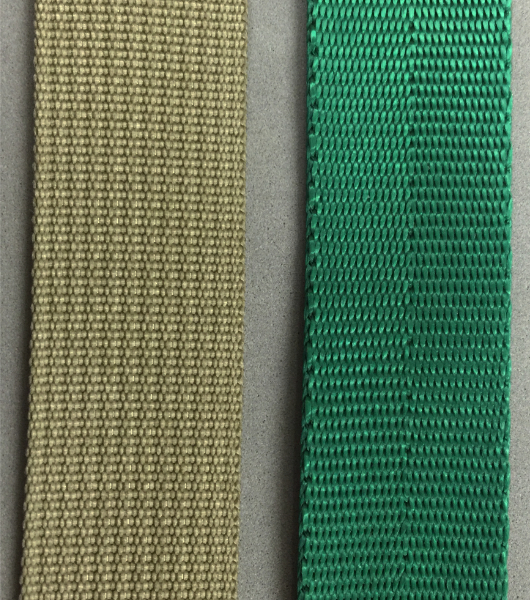 Here we have Mil-Spec webbing in Coyote Tan and standard weight nylon webbing in green. You can see the construction is different and the Mil-Spec webbing has a breaking strength of 1200 pounds (this material has a design strength unlike the commercial grade products). 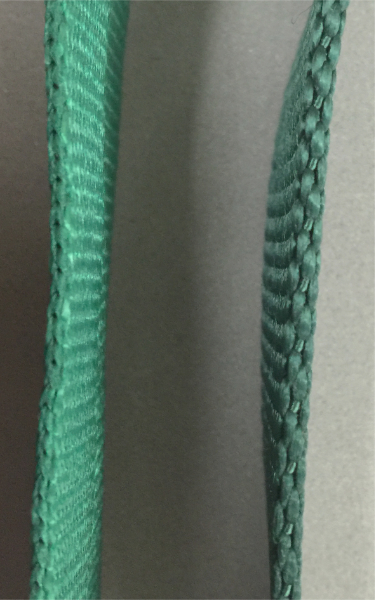 This gives you an idea of the construction difference between the Mil-Spec and commercial nylon webbings. Tubular construction is the strongest of our nylon webbings. It is really two layers of webbing so you get a breaking strength of 4000 pounds in a 1″ width. This view gives you a good idea of the amount of nylon used in the tubular construction which is why you get the added strength. Standard weight is great for tie downs and general purpose straps. 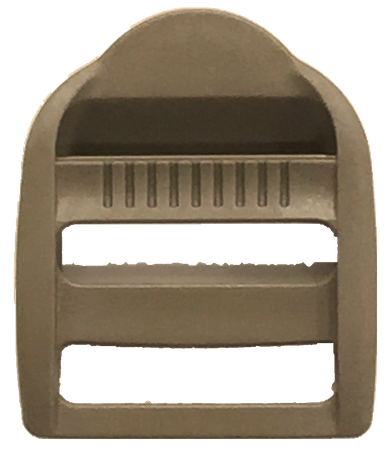 It is used on backpacks for attachment points and it works well with single lock buckles and slides to allow for adjustment. Heavy weight nylon is used extensively for pet leashes and collars. It feels nice in your hand (this is why it is used for leash’s, not that you need the strength) or around your pets neck. We also sell it for heavy duty tie downs. 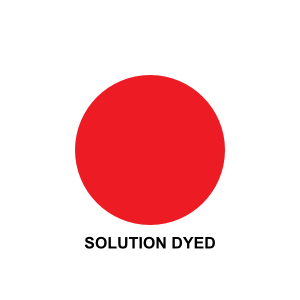 We stock a wider range of colors in the heavy weight product than our other offerings. 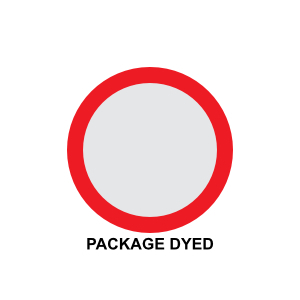 Mil-Spec nylon is used in the same way as the standard weight commercial product. It is a bit stronger but the trade off is in stiffness. If you are making MOLLE loops, this webbing would be a good choice. Tubular nylon is the climbers friend. Slings and attachment points are commonly made using tubular nylon. It holds a knot well and feels good in the hand. If you have questions on what product would best meet your needs, give us a call at (253) 883-5800 and ask for Rollie. 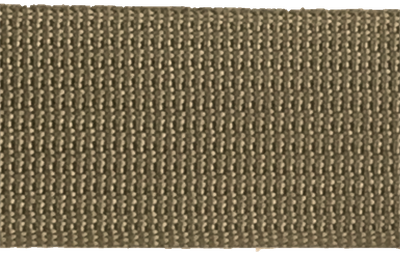 We now have 1″ webbing and buckles in coyote tan. It’s hunting season and colors that blend in are required. 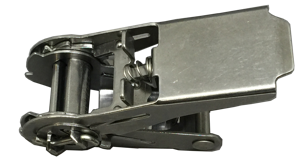 In stock are side release and ladder lock buckles along with nylon webbing that meets MIL-W-17337. As with all our goods we will sell 1, or 1 foot, up to as many as you need and they will ship for $6.00 via Priority Mail.